Brooklyn & Boyle | Art and Life in Boyle Heights : DTLA's Five Star Bar: In the Wrecking Ball's Trajectory? DTLA's Five Star Bar: In the Wrecking Ball's Trajectory? 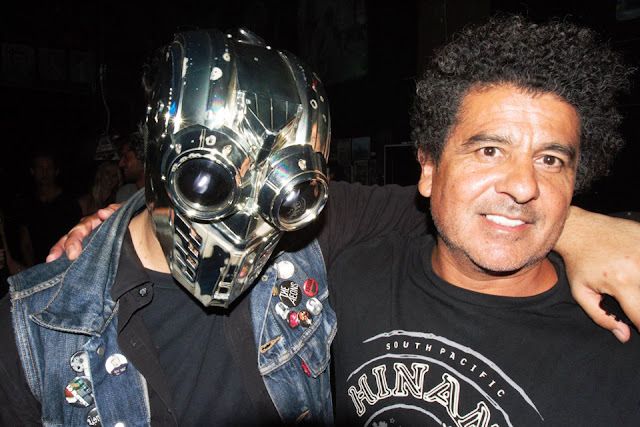 NK-Riot, the performing entity developed by Kristopher Escajeda (l.), visits with Five Star owner Marco Cordova. Marco Cordova is busy booking bands to play the Five Star Bar well into February. He just isn’t sure if there will still be a space for them to perform in by then. Cordova, owner of the well-known live music venue on South Main Street, is the latest small business owner to become the target of big business interests seeking to transform the face of Los Angeles. The night club and entertainment establishment where the Five Star Bar resides was called The Columbine when it was purchased in 1971 by Cordova’s father, who passed away in 1992. Since then, the place has been a hot spot for some of the best in local indie and Punk rock. Major artists such as Kendrick Lamar have even filmed music videos at Five Star. “A lot of bands that have been starting out, this where I gave them an opportunity to play. A lot of them have managers now, they’ve gone on to play bigger venues. They’ve all come back. I guess it is kind of my legacy. And the bar’s legacy,” said Cordova. That legacy is now threatened as the area where Five Star—and other small venues, such as The Smell—are located, have become minor administrative details in a real estate deal at the hands of the L&R Group of Companies. According to their website, L&R already owns more than 85 parking locations in downtown Los Angeles. Their most famous parking chain is Joe’s Auto Parks. Regular visitors to downtown who have endured the crucible of paying for parking will know the name. As Cordova tells it, L&R came in quietly and purchased adjoining properties previously owned by his original landlord in 2015. The company waited until the occupants’ leases had expired to make the move. The property acquisition also included The Smell and The Jalisco. The first sign of the ownership change arrived in the form of a spike in monthly rental statements sent to the small businesses currently leasing spaces on the property. With the rapid metamorphosis taking place across much of city’s core, with more and more building projects tied to steady influx of affluent buyers, Cordova is not surprised at Five Star’s fate. “I think when they first purchased the property, they weren’t aware of what was actually there,” said Cordova. “I think, I could be wrong, that their plan was to mow down this whole block…and just level it off, put some stripes down and charge for parking.” It is no secret that downtown LA parking is now at a premium. Yet for all the tell-tale hints, it is hard for Cordova to know exactly what will happen because he is not in regular communication with the new owners of the property where his family has been in business for over 40 years. He is, in spite of it all, committed to providing a home for emerging musical acts and a laid back, neighborhood-style pub—for new patrons as well as the long-time customers he inherited when he stepped in as steward after the passing of his father—as long as possible. On a Friday in August, Cordova confided, he made an effort to deliver his rent in person. When he reached the downtown office address listed on correspondence sent by L&R, he was surprised to discover an empty suite of offices. Although L&R is not legally required to notify tenants about a change of address, Cordova was admittedly disheartened. Managing the club demands considerable time. Lately, navigating through downtown construction, street repairs and traffic requires the patience of a saint. After the initial shock at the demolition note, he would just wait until he heard from someone. “I just wanted to see somebody. That’s all,” recalled Cordova about his initial reaction. His efforts to reach someone for a discussion about his options and timetables have not gone unnoticed, he admitted. Little by little, as the process has inched forward, Cordova has realized how entities like L&R are so massive, that they are able to purchase large swathes of property and simply sit on them as a routine function of their business activity. And L&R is, after all, a holding company. Beyond adding acquired properties and their associated leaseholders to an automated billing system which also generates basic form letter correspondence, such enterprises do little more until some kind of plan for the property is finally formulated. “I feel for everyone here. They’re my neighbors. I know it’s the corporate world, but it’s just not what I’m used to,” observed Cordova. As he sees it, the fate of Five Star and its neighbors is part of the overall makeover of downtown Los Angeles. Cordova holds out hope for the possibility of reaching an agreement on the new rental rates and a lease renewal. He is also willing, he said, to mediate and help find a buyer who can bring more to the table and partner with the new landlord. With unavoidable changes in the air, Cordova spoke with blunt honesty. “I don’t think there’s a place for Five Star here anymore, for that type of bar.” But until something specific develops, Five Star Bar still has a place for now.